Birds - Animal Wonders Inc. Colorful, beautiful, loud, smart, & amazing. Birds are wonderful animals to know and understand. See Animal Wonders' bird residents below and learn a little more about these beautiful animals. Click on their pictures to see their biography. Harris's Hawk (Parabuteo unicintus). You could find a free flying Harris's Hawk in the south western part of the United States all the way south through Mexico to Argentina South America. These raptors can have a wingspan of up to 4 feet and they live in groups, or packs, instead of solitary. They hunt cooperatively and are favored by falconers because of this behavioral trait. Harris's Hawks are intelligent and their eyesight is impressive. Several from the pack will flush the prey from cover while another will swoop down and use their strong talons to stun and grab the prey and then cover, or mantle, the prey with outstretched wings to hide their catch. 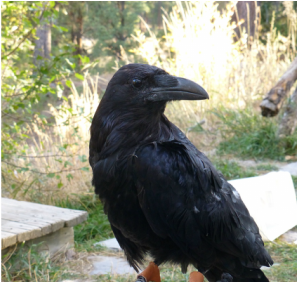 Common Raven (Corvus corax). Info coming soon. Blue and Gold Macaw (Ara ararauna). Info coming soon. Green Winged Macaw (Ara chloropterus). Info coming soon. Red Lored Amazon parrot (Amazona autumnalis). These birds are found in the wild in South America. They live in large groups called flocks. In the wild they eat fruit, vegetables, flowers, seeds and leaves from the trees they love to play in. Parrots are birds that are known for their ability to "talk" like humans. Many people have a parrots as pets because of their intelligence and beauty. These birds can live 60-80 years old! 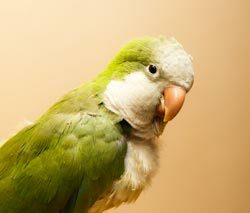 Sometimes a pet parrot has to be put in the owner's will because they outlive their human! Parrots have really neat feet. Instead of 5 fingers and toes like us. They have 4 toes, 2 in the front and 2 in the back. This helps them hold onto branches. Their toes are so strong that they can hang upside down by one toe! Lilac Crowned Amazon parrot (Amazona finschi). These birds live in South America in humid rainforests. They live in large flocks and eat fruits, flowers, seeds, etc. Parrots can live 60-80 years old! Most parrots have the ability to talk. Some never say a single human word and others say over 100 words! Like other amazon parrots Lilac crowned Amazons can mimic but are not as outgoing as other species. They are shy but can learn to be confident with a supportive family and lots of practice. 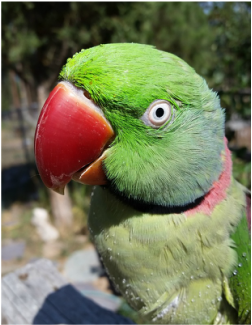 Alexandrine Parakeet (Psittacula eupatria). This is the largest species of parakeet. Parakeet, is in pscittacine family like parrot and essentially it means small parrot with a long tail. These parakeets have extra long tail feathers that can make up more than half of their total length! They are named after Alexander the Great who sent them to nobles as a status symbol to express his gratitude or friendship. The males and females are sexually dimorphic, meaning that there are physical characteristics that you can see. Males have a black ring around their neck with a bright pink neck band. Females are duller in color without the black ring. Immature males look similar to females, they grow in their black feathers when they mature at around 3 years of age. Quaker Parrot or Monk Parakeet (Myiopsitta monachus). Info coming soon. Jenday Conure (Aratinga jandaya). Info coming soon. These birds are smaller than a parrot and larger than a parakeet. Jenday Conures are known to be one of the loudest of the conures but they are also one of the most colorful. They live in flocks of up to 30 and confuse their predators by all their bright colors. They live in South America in humid forests where they spend most of their time looking for food. They eat fruits, flowers, berries and nuts. Halfmoon Conure (Aratinga canicularis). Info coming soon. Green Cheek Conure (Pyrrhura molinae). 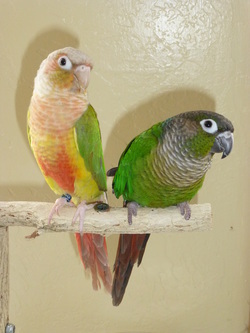 Green cheek conures are found in southern Brazil and northern Argentina in forested areas. They form huge flocks and eat seeds, berries, fruit, and grains. 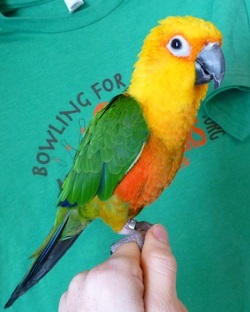 They are one of the smaller conures and are commonly kept as pets. They are known for their loving and curious personality. 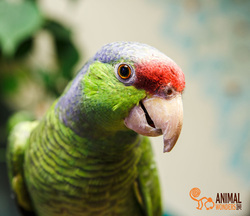 If well taken care of and given a healthy diet, green cheek conures can live up to 35 years. Cockatiel (Nymphicus hollandicus). Info coming soon. Pacific Parrotlet (Forpus coelestis). Info coming soon. Budgerigar (Melopsittacus undulatus). Info coming soon. Ringneck Dove (Streptopelia risoria). These pigeon like birds are a domesticated breed of dove that is thought to have originated from the wild African Collard Dove. They have been kept as pets for over 2,000 years are are easy going and hardy. They have a distinct ring around the back of their neck and they can come in many different colors. The most common color mutation is albino. 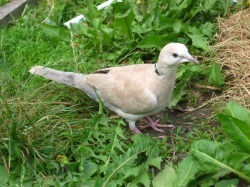 The white doves often released during a wedding ceremony are albino ringneck doves. These birds are considered an invasive species so care must be taken if keeping as a pet so that they do not escape and invade environments in which they do not belong. The males make a sweet cooing call and will dance and coo to impress the ladies. Fancy pigeon (Columba livia). Fancy pigeons are just fancy looking pigeons. They were bred by pigeon breeders to look different just like dogs are bred to look different. There are over 100 different breeds of pigeons and they all came from the rock pigeon from Europe. Some fancy pigeons are bred to have extra feathers on their feet, or tails that look like fans, or have a talent for finding their way home like homing pigeons. Pigeons eat just about anything they can find but if you keep them as pets they need to have a special pigeon food. People sometimes call them rats with wings because there are so many in cities. These city pigeons are mutts, mixed breeds that flourish around large populations of humans. Pigeons are monogamous, keeping their mate for life. The parents make a team effort in raising their young. Usually the father takes the night shift sitting on the eggs and the mother takes over for the day.